So I went to the dealer to get my oil changed primarily, but also to test drive a used 2012 GT they had. I wasn’t allowed to drive that because insurance reasons. 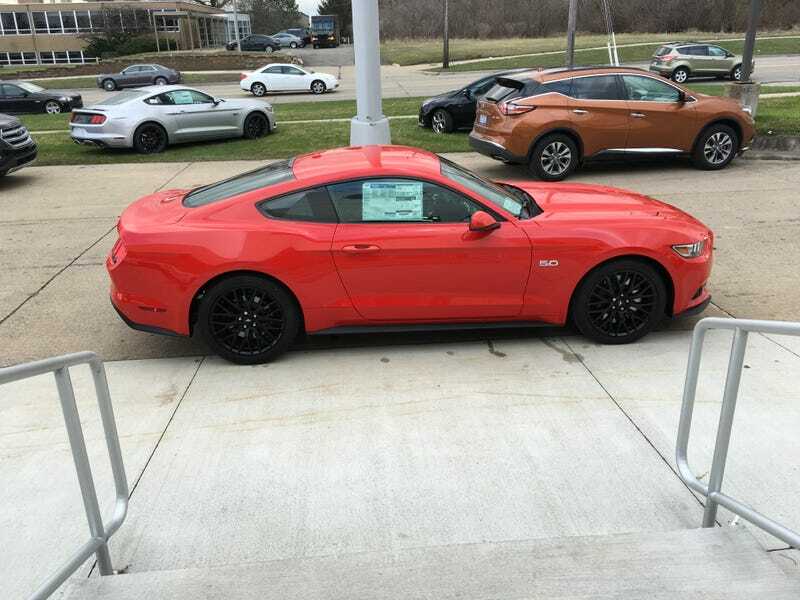 So I wanted to drive a manual Ecoboost, but they didn’t have one of those either; this was the “consolation prize”: a 2016 GT with the Performance Package. For the first time, I actually found a comfortable driving position in the new Mustang. When I drove an Ecoboost last year, I found the car to be bigger than I thought, and nerve racking in traffic; of course this is coming from the guy who drives only compacts and hates big vehicles like trucks and such. After a year of not driving a new Mustang, I somehow found it easier and more comfortable to drive, and it felt a whole lot smaller to me. It had very little to no feel feel whatsoever. And it made shifting the opposite of smooth and comfortable for the first mile. I loved how notchy the shifter felt rowing the gears. It probably has another one of those damn assist springs, and I’d remove it the minute I got the car, if I was getting one. I took the spring out of my ST and it has more heft and feel than this car. This, now being the most powerful car I’ve ever driven, the instant torque on demand from the 5.0L is amazing! It didn’t matter what gear I was in, even though I only used 1st-4th, it was just awesome. And the noise, it’s such a sweet sound. The acceleration threw me into the seat and the giggles, oh the giggles I giggled. Going around the few corners I could, I found it to be great in a DD role handling and comfort-wise with the Performance Package, but I found the seats lacking any support for me. Again, I love bolstered seats that hold me in place like my 944, so if I were to get a Mustang of any kind, RECAROs would be an absolute must. I left the test drive and dealer with only one mixed feeling on the car. I loved the motor and the sound. But there’s no way in hell I could ever rationally or logically justify it ever. And that pisses me off. 400+hp is a crapton of power, and maybe the fact that I couldn’t use all that power at once at any point except for one almost empty stretch of road made me question why in the hell I’d need one as a DD at all. It just wouldn’t make sense. Maybe because I’m still young and in college with not much money to splurge on such things; maybe if I had more money, I wouldn’t be saying what I’m saying now. But dammit that’s a lot of power, more than I would need, and it was a bit uncomfortable as well having that much power that can’t really be used. I can finally say that honestly, I’d rather have the Ecoboost as a DD than a GT, but I wish there was a lower powered V8 option as a mid-range so I could have the V8 noise without all the power I really don’t need. The Ecoboost is just a lot less “in your face” and sensible for me. The GT felt like a car you’d use on occasional drives or weekend car with all that power. And if I were to go on and want more power one day, if I wanted V8 power, the EB could be gradually modded to that point and I could get use to the power without having to jump from low power to high power cars. So yeah, I think EB is rationally an logically the right car for me, and I don’t think I’m crazy for saying that. I just don’t find myself wanting a V8 as much as I thought I did. I’m annoyed by it, but I’ll live with it, and maybe one day stop being jealous of V8 owners; at least I’m not as jealous as I use to be after this. Now ask away and stuff.